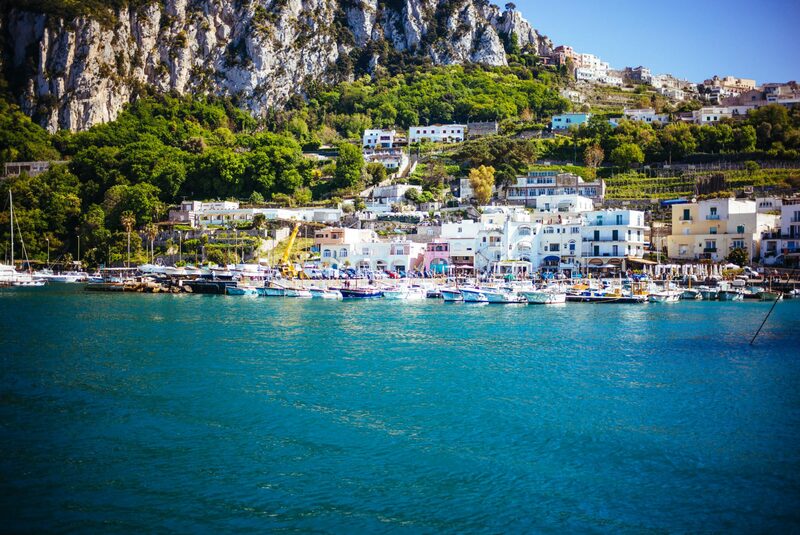 The Amalfi Coast is a top Italian destination for a relaxing vacation or a romantic honeymoon. It’s a rugged, 25-mile long stretch of coastline along the southern edge of the Sorrentine Peninsula with cliffs that dramatically drop into the Mediterranean Sea. A steep mountain range separates the northern edge of the peninsula on the Bay of Naples from the Amalfi Coast. It’s one of the most beautiful beach destinations in Italy, but it’s not the easiest to get to. 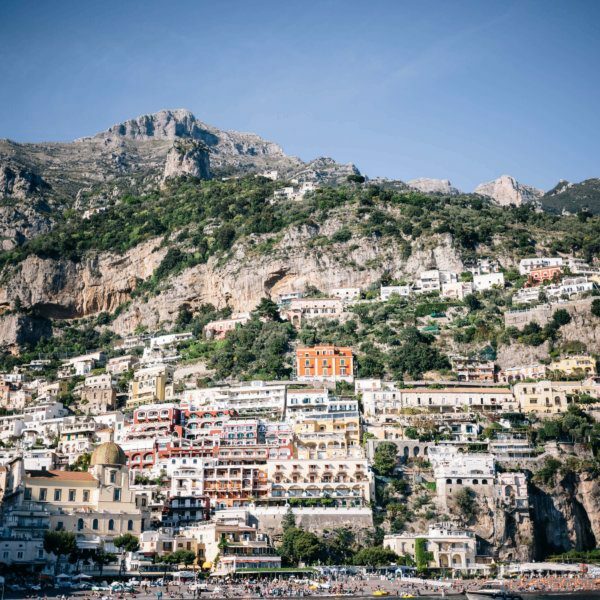 That’s why after several trips and requests, we’re sharing with you our recommendations on how to get to the Amalfi Coast with the least amount of stress. 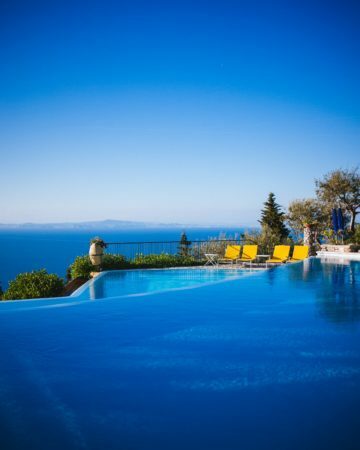 If you’re planning your dream trip to the Amalfi Coast, we’d suggest booking everything far in advance. First, decide on the time of year to visit, and the cities you want to explore, then go ahead and book your hotels or rentals so that you don’t run into problems with availability over your desired dates. After you have your room booked, the next step is figuring out the logistics of how you’re going to get there. Most travelers go through Naples to get to the Amalfi Coast. If you are flying from Europe, there are numerous daily flights directly to Naples airport. The closest airport outside of Naples is Rome. There are usually many direct flights from the U.S. to Rome, especially during the summer. Unless you want to spend time in Rome prior to heading to the beach, we’d suggest taking the Da Vinci Express train from Rome’s Fiumicino Airport to the Roma Termini train station, then hopping on the next Frecciarossa train to Naples or Salerno. There’s no need to buy train tickets for either train in advance. In fact, we don’t ever purchase our train tickets ahead of time since we don’t know if our flight might be delayed. It’s less stressful, and it’s easy to purchase train tickets at the self-service kiosks at the train station. People think that renting a car for a drive on the Amalfi Coast sounds romantic, like renting a convertible and driving up the California coastline. We’re letting you in on a secret. We haven’t rented a car on the Amalfi Coast, and don’t ever plan to. We strongly advise against renting a car to get to the Amalfi Coast for several reasons. Naples has a reputation for being a difficult city to drive in, and the roads of the Amalfi Coast are high, steep, narrow, and winding, and depending on the season, incredibly crowded. Buses and cars cannot pass each other, so there is a high probability that at some point you will need to put the car in reverse and back up enough to let a bus through. Even locals have complained to us. If you’re not accustomed to driving on cliffs, it’s not recommended – plus you’re on vacation and you should relax. We recommend that you book a car service from Naples airport or train station to your hotel and relax after your flight (and train ride). Once you get to your hotel, you can walk, take a ferry or private boat, or ask your hotel to book a car to get around. If you are going to Capri, Procida, Sorrento, or Ischia, you can easily take a high-speed ferry from Napoli. Take a taxi from the Napoli train station or airport to the dock. You can purchase your tickets there. If you plan to arrive by ferry, you’ll probably have a lot of luggage to drag uphill, so we recommend coordinating with your hotel for a car or taxi ahead of time. Once you’re in your destination, you can take a number of ferries to another destination like Positano or Amalfi. If you take the Frecciarossa to Salerno (one stop past Naples), you can take a ferry to Amalfi or Positano. We usually opt for the route through Naples and if we have time we make a stop for a pizza and sfogliatella. Naples gets a bad reputation from nervous American tourists, but it’s one of the most fascinating cities in Italy, has some of the best food, and you can rest assured that any problem people complain about with respect to Naples is ten times worse in San Francisco. There are several options to get from one town to the next. You can take the high-speed ferries to some of the most popular towns, or use those as base locations. There’s also a network of Sita buses and water taxis. You can also book a driver to get to off the beaten path restaurants, wineries, and hotels. Some resorts offer complimentary shuttles. For example, Casa Angelina in Praiano offers an hourly shuttle between the hotel and Positano.